The application cycle for the 2019 Cohort is closed. Please check back in the fall for updates on application information for the 2020 Cohort. The Sustainable Oceans: from Policy to Science to Decisions program* at UC Davis trains the next generation of quantitative marine scientists under a new paradigm that begins with the decisions facing policy makers to generate use-inspired research questions around ocean and coastal management and ecosystem-based fisheries management. The California State University Council on Ocean Affairs, Science, and Technology (COAST) has partnered with the UC Davis Coastal and Marine Sciences Institute (CMSI) to create the new CMSI-COAST Scholars program that includes CSU Master’s students engaged in ocean and coastal management issues in the Sustainable Oceans training program. Participation is not limited to life science based students, and students from diverse fields are encouraged to apply (e.g., applied math and data science, biogeochemistry, geography, geology, oceanography, political science, public health, resource economics, etc.). A field trip will introduce CMSI-COAST Scholars to the technical, cultural, biological, economic, and institutional forces woven into the fabric of resource-dependent communities in California and beyond and will include meetings with a wide spectrum of marine resource stakeholders. The field trip will occur in June at the end of the first year of the Scholar’s graduate program. The basecamp will focus on a marine resource management issue with decision-makers, including colleagues from private-sector interests, non-governmental organizations, and governmental agencies, and community-leaders. Each basecamp will bring together a diverse set of stakeholders to discuss the trade-offs involved with a management goal. The basecamp will be held in September and will help CMSI-COAST scholars develop use-inspired research projects and broaden their network with ocean and coastal policy leaders that could help improve the broader impact of their research. At the end of the second year of the Scholar’s graduate program, CMSI-COAST scholars will present their thesis research at the Sustainable Oceans research symposium which will also involve UC Davis faculty members and graduate students. Scholars will be expected to remain in good standing with their home institution and maintain a GPA of 3.00 or higher. Complete the Application form (https://docs.google.com/forms/d/1VyC8h6nqroZOVZdVrAb5hp2_-F_8o22hADf015rSQIA/prefill). Submit transcript (unofficial ok) from Fall 2018 through the application form. Request a letter of recommendation from your primary advisor. Advisors should submit your letter directly to (https://docs.google.com/forms/d/15iosjDYBT7qgRHZvE6SowY93-bjEq2MNDaEZkOdPodo/prefill) by the application deadline of 5:00 p.m. PST Monday, January 14, 2019. It is your responsibility to make sure that the letter is submitted on time. All application materials must be submitted by 5:00 p.m. PST on Monday, January 14, 2019. Late applications will not be accepted. Applicants will be evaluated based on the quality of their writing, the strength of their letter of recommendation, and their potential ability to bring diverse viewpoints and approaches to ocean and coastal management issues. For questions or additional information please contact Beth Pardieck (epardieck@csumb.edu), COAST Coordinator, or Maya deVries (msdevries@ucdavis.edu), Sustainable Oceans NSF NRT Graduate Program. 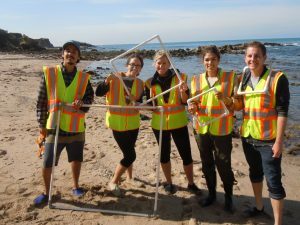 *The Sustainable Oceans: from Policy to Science to Decisions program is funded by the National Science Foundation Research Traineeship (NRT) Program. Photo courtesy of William Hoese/CSUF.